TIGHAR’s expedition to find out what happened to celebrated pilot Amelia Earhart is returning to Hawaii without the evidence it was looking for. The International Group for Historic Aircraft Recovery (TIGHAR) believes Amelia Earhart and her navigator crashed on a Pacific island and died soon after. The $2.2 million expedition was searching for evidence of the wreckage in the waters around Nikumaroro. Amelia Earhart was the first woman to fly solo across the Atlantic, in 1932. “This is just sort of the way things are in this world,” TIGHAR president Pat Thrasher said. Next year TIGHAR is planning a return voyage to the island, where they believe Amelia Earhart may have survived for a short time. The research team collected video and sonar data, and is expected to begin analysing it on the return journey to Hawaii, Pat Thrasher said. Updates from her husband, Ric Gillespie, who founded TIGHAR, suggested the search was cut short to five days from 10 because of “nightmare terrain”, and accidents with equipment. 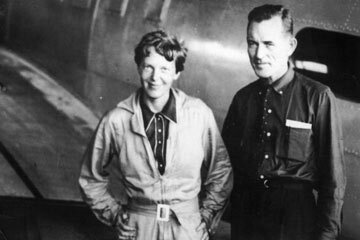 On 2 July 1937, Amelia Earhart and her navigator Fred Noonan took off from Papua New Guinea in their Electra 10E aircraft, en route to Howland Island. Many experts think a navigational error caused the pair to run out of fuel over the sea. They were never seen again. They were three-quarters of the way through an unprecedented circumnavigation of the globe around the equator. On 3 July, the USS Colorado departed from Hawaii in search of Amelia Earhart and Fred Noonan. The research team set sail 75 years to the day after search teams went looking for the pair. TIGHAR’s expedition had the approval of the US state department and Secretary of State Hillary Clinton. Artefacts that could have belonged to Amelia Earhart and Fred Noonan have been found on earlier visits to the island and a photograph of the coast from October 1937 could show a blurred image of part of the plane.